Several months ago, I hosted several lively roundtable discussions, with beauty industry executives, on the topic of product development. Throughout the various sessions, the CEOs, marketers, product development managers and sales executives present all had one clear and consistent point to drive home- product development is painful! For many, the process (from start to finish) is wrought with problems (ahem, challenges) that are expensive and incredibly time consuming. Delayed products, cancelled launches and over-budget end results can derail brands of any size. This unfortunate reality is what many brands suffer through, unnecessarily. Spoiler alert- there are no “tricks” to product development, however, the secret sauce has everything to do with pre-planning. Doing the work up front and crafting a process with accountability is, really, the only way to get it done with a degree of ease. If you haven’t spent the time to understand what you are looking for and at what cost, how are your chemists, designers or manufacturing partners to be expected to know either? The first step is research; a thorough understanding of the market and where, exactly, you are hoping to fit in or stand out, is essential. This applies to the product concept, yes, but solid direction always involves a pricing strategy as well. Major frustrations bloom when cost prohibitive projects are benched at the end of a development cycle. To avoid this happening to you and your brand, you must develop a solid price position that can then be worked back into your product cost, packaging and labor. After months, maybe years of hard work, it can be tempting to fast track your new products without target market testing. Don’t do it. Market testing, even on a small scale, is so important to the well-being and longevity of what you’re launching. Whether your budget is big or small, find an affordable way to get your product into the hands of those who will actually use it, not just those closest to you. Honest, objective feedback is important- listening to it, even more so. 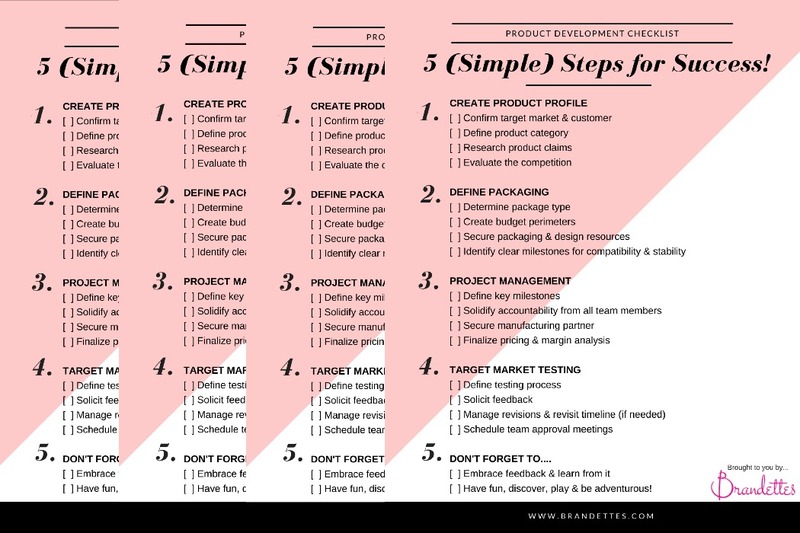 To ease your pain, I’ve put together this FREE Product Development Checklist (PDF) for use when planning your next launch. It’s a paired down version of the project management tool I gave the aforementioned roundtable participants, designed to be a point of reference as you craft your detailed project plan. Feel free to download it, share it and use it to your advantage. Need help pushing your projects over the finish line? Brandettes offers full-spectrum product development support from ideation to completion. Get in touch to learn more about our process.